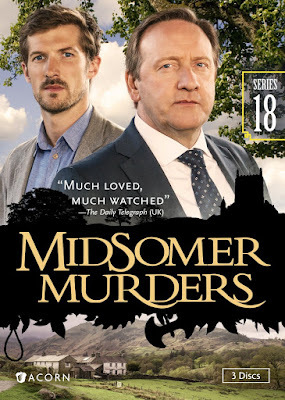 Returning with all-new episodes of the beloved mystery series, Midsomer Murders, Series 18 makes its DVD/Blu-ray debut on September 20, 2016from Acorn, an RLJ Entertainment, Inc. (NASDAQ: RLJE) brand. The cozy villages of Midsomer County reveal their most sinister secrets in these six new, standalone contemporary British television mysteries inspired by the novels of Caroline Graham, modern master of the English village mystery. Neil Dudgeon (Life of Riley) stars as the capable DCI John Barnaby, with Gwilym Lee (Land Girls) in his final episodes as his partner. Previously broadcast in the UK in early 2016, with its U.S. Premiere on Acorn TV in July 2016, the Series 18 DVD and Blu-ray 3-disc sets each feature six episodes ($49.99, $59.99, AcornOnline.com). All episodes from Series 1 through Series 18 are also available to watch in their entirety on Acorn TV, the premier North American streaming service for world-class television from Britain and beyond. Habeas Corpus—When the corpse of an elderly man disappears from his deathbed, Barnaby and Nelson find themselves on the hunt for a serial body-snatcher. The Incident at Cooper Hill—The death of a forest ranger in a UFO-sighting hot spot leads locals to believe that she was killed by aliens. Breaking the Chain—When a champion cyclist is murdered minutes after winning a race, suspicion falls on both his rivals and his teammates. A Dying Art—A wealthy eccentric dies on the opening night of his outdoor sculpture park, his body positioned in one of the artworks. Saints and Sinners—Hours after making an important find, an archaeologist is found buried alive at the site of her dig. Harvest of Souls—Barnaby and Nelson investigate the death of a man trampled by a horse near the Whitcombe Mallet Harvest Fayre. Habeas Corpus—There's a serial body snatcher on the loose who steals an old man's body before it even gets cold. The Incident at Cooper Hill—A forest ranger dies and it's possible aliens are involved. Breaking the Chain—A champion cyclist is murdered and his rivals are the top suspects. A Dying Art—A wealthy collector's body is made part of his own art show. Saints and Sinners—An archaeologist is buried alive right after an important discovery. Harvest of Souls—A man dies after being trampled by a horse, but it may be "foal" play. In addition to the full season of episodes, the DVD set also includes a featurette about the actors, magic tricks and some behind the scenes footage. If you want to get the advantage of a full set of amazing stories that will leave you on the edge of your seat, than this is the box set for you. You can order Midsomer Murders Series 18 for only $49.99 at Acorn Media or online at Amazon. There is a chance you are qualified to get a free $1,000 Amazon Gift Card.